If you have been wondering when summer really begins, the answer is TODAY. Our annual Summer Reading Club starts today. Why is that such a big deal? Let me tell you . Over the summer, schoolchildren experience something called the "Summer Slide". Click on that link and watch that 2 minute video if you want a visual of what happens. Suffice it to say, keeping your child reading and learning throughout the summer is a Very Good Idea. And it can be FUN! That's what the Summer Reading Club at the library is all about. We don't ask our readers to read anything they don't want to read. Besides novels and picture books, we encourage audiobooks, magazines, comics, and even the back of cereal boxes. Just read, that's our motto. Kids who finish the program even earn a free Fast Pass to Upper Clements Park. And guess what? 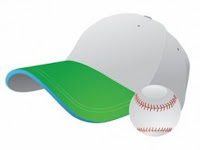 the Summer Reading club is FREE. Yes, that's right, FREE. Just head to your local library to sign up. It is that easy. And if you are not yet convinced, read this blog post from a librarian in the states. She gets it and wants you to sign up for Summer Reading. Because we know that people of all ages like to read and win prizes, we have a Summer Reading Club for TEENS. Readers ages 12-16 can read and enter to win great prizes and earn a Fast Pass to Upper Clements Park. And this year, we've added a Summer Reading Club for adults! Readers ages 17 - 170 are invited to complete 2 cards for chance at some nifty prizes. Pick up one card at your local library, and one at one of our Community Locations. You can show us your progress this summer with the hashtag #AVRLSRC. Follow along on Twitter, Facebook, and Instagram. Show your library love on social media! 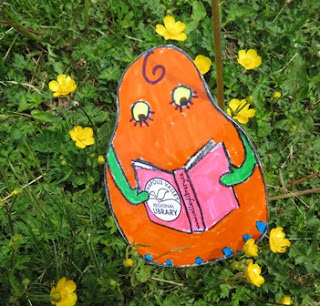 And don't forget to print our SRC Mascot, RAVEL, and show us where you take our little friend. Oh, I nearly forgot to tell you about our Summer Programs! You can enjoy Storytime with a Farmer, Little Ray's Reptiles, Anne Glover's String stories, Mad Science, tech programs, Preschool Disco, Musical Zoo, and Camp Overdue (summer camp for teens and adults). We will also give away books at each branch. And you could win a bike. And all of this is FREE! So run, don't walk, to your nearest library and get signed up for Summer Reading Club. See you around this summer. The next time you are visiting your local library take some time to check out your surroundings. Not only is the library a place for books, conversation, and research, you can also add art gallery to its resume. We have an abundance of talented artists and crafters in our communities, and our libraries are more than happy to showcase their work. 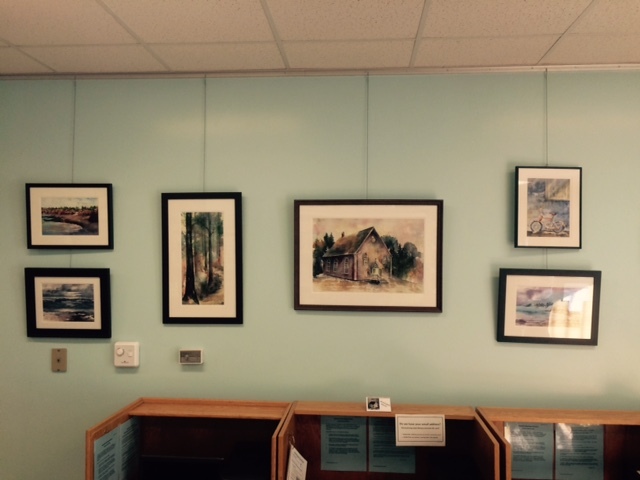 "We have a great art gallery wall", says Andrea Leeson at the Kingston Branch. "I change it about every three months. 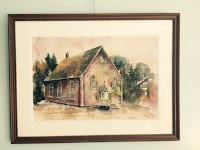 I try to have local artists from the area; between Wilmot to Aylesford, more or less, because there are so many all over the Valley." "Why do they exhibit? Because I ask them to! I am trying to give the village a cultural focal point." The artist names are posted along with information pamphlets if someone is interested in purchasing a piece. 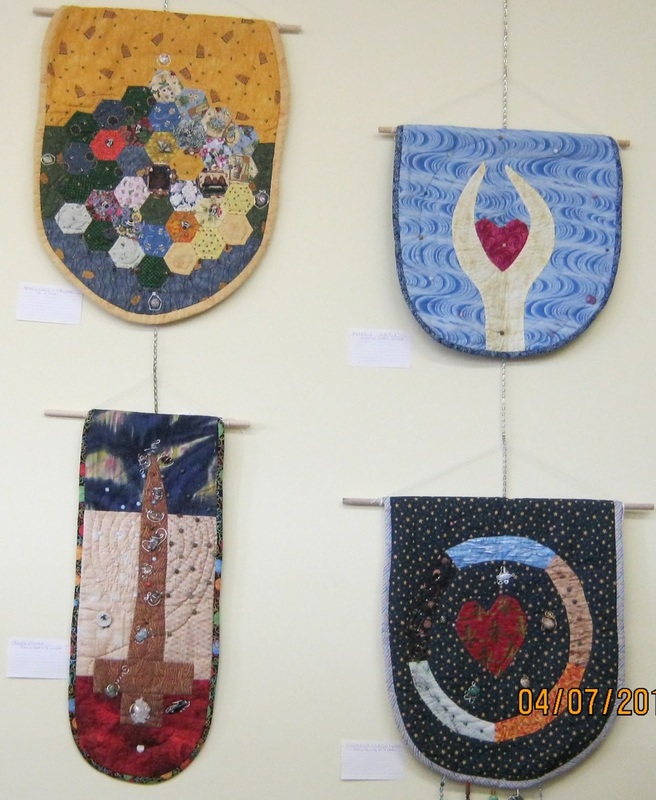 There is a lovely display of art and crafts in the Rosa M. Harvey Middleton and Area Library that is displayed on an eight-week rotation. 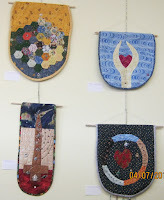 Most pieces are for sale by the artists and information is available if a person is interested in purchasing, with no commission to the library. Gail Aldred is the contact person in Middleton. She keeps a list of artists that have participated in the displays and of new ones willing to show their wares. They are very happy having people appreciate their hard work. The art wall at the Wolfville Memorial Library features a different artist every month. Penny Lakes oversees the display. She either contacts artists she has heard of locally, or artists will contact staff about displaying their art. like to have their art seen by the public and all artists have been enthusiastic about the displays here. People love the art wall. Patrons and artists alike." 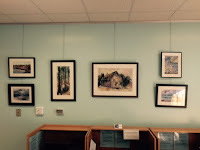 ﻿ So the next time you are at the library, before or maybe after you have that huge pile of books, magazines or DVDs in hand, check out the creations of all of those wonderful and talented artists out there who happen to be your neighbours. The construction of the new Berwick & Area Library is well under way! The new space will again be in the Berwick Town Hall complex at 236 Commercial Street, but will be twice as large, 2190 sq. ft. It will have access to more program rooms, a larger section for youth and an inspiring area for children. As well as a quiet reading area for adults. You will enter the library through the "Community Living Room". A place to gather with your community neighbours, to relax, or to read a book or magazine either online or in hardcover. Outside the windows will be a landscaped green space with outdoor seating and wifi access under large trees. It will be in close proximity to the sidewalk so you can't miss it. A dedicated group called the Friends of the Berwick & Area Library has formed to help fund raise the necessary amount to outfit the new space with inspiring furnishings and equipment. If you would like to join this group or receive up to date information please contact the Berwick Library, 902-538-4030, to be added to the email list. If you have any questions or would like to make a donation you may do so here (Canada helps ) or drop in to the Berwick Library temporarily located in Wilson's Pharmasave at 213 Commercial Street, Berwick. Summer. It is nearly here and at the library, that means one thing. The annual Summer Reading Club! This year we have a few extras that we think you will be excited about. As usual, we have the Summer Reading Club for kids and teens. Kids up to age 12 can sign up, read and do activities, and win cool prizes like pencils and a Fast Pass to Upper Clements Park! We are even giving away a bike this year, courtesy of Adopt-A-Library. Our teen readers, ages 12-16, can read and enter to win prizes. For every five hours, teens get a ballot to enter for prize draws. And they too can win a Fast Pass. This year, we've added a Summer Reading Club for adults! Readers, ages 17 -170 are invited to read and enter to win prizes. Each adult club member can enter twice-- we have one card at our libraries, and one that will be available out in the community. Read, enjoy your summer, and you could win some really fun prizes. Because why should little kids have all the fun? We've got great programs lined up for you too. We are happy to host Anne Glover, a storyteller from BC who will be doing string stories in several of our branches. We are bringing back Little Ray's Reptiles and Mad Science for your educational entertainment. To celebrate our local farms, we are hosting Storytime with a Farmer in all our branches. We've partnered once again with Oaklawn Farm Zoo to bring you two free Zoo Days-- July 5 and August 9, where our friends ages 18 and under who have library cards can get in free to the zoo! We've planned some fun things like PreSchool Disco, Musical Zoo, storytimes, tech programs, and more. 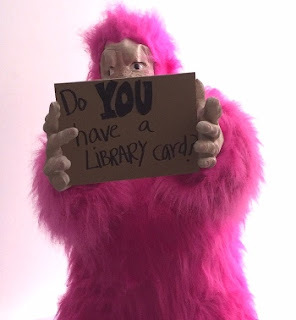 There will even be Pink Gorilla wandering around, looking for library lovers to give prizes to. Teens & adults, don't feel left out! We've put together a fund program just for you! Camp Overdue is a Summer Day Camp just like when you were a little kid, only made for more grown-up people. Play, make crafts, enjoy S'Mores, and write a letter home. But no little kids allowed. It all begins June 27. Visit your local library and find out what summer has in store for you! Our annual Staff In-service is Monday, June 6th. All locations are closed on this day so that staff can gather together, learn, share, interact, and ‘develop’ professionally. Our goal is to return to job duties and demands with a renewed sense of purpose, with improved skills and confidence, motivated to perform our tasks effectively and efficiently. 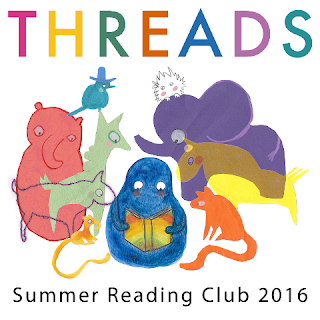 Staff will be getting tangled up in THREADS, the 2016 Summer Reading Club theme. Plans will be unveiled for this ever-popular summer program that sees kids and teens reading and using the library like mad after the school year is over. Each year, the program is tweaked and shaped to keep things interesting and engaging. NNELS (National Network of Equitable Library Service) will be the subject of one workshop. NNELS is a repository of content owned and sustained by Canadian public libraries working with international partners, libraries, readers and publishers (particularly Canadian ones). The service makes copies of books in accessible formats available to readers in Canada who have print disabilities. Another topic will be Immigrants in our Community. Two guest presenters will enlighten us with individual stories that speak to the journey of immigrants and the community services which are required. We’ll look for innovative ideas that reach out to newcomers. Lisette Jones, owner of ThinkSmart Training & Consulting, will speak to staff about Generational Differences. This workshop will show us how each generation ticks and how that information can be used to work with other people more effectively. We’ll hear about themed programming for seniors. Creative Reminiscence: Themed Senior Programs has been developed by one of our bookmobile staff for use in serving residents in senior-type facilities. These can include songs and associated props that spark conversation and memories of days gone by. There will be general library business as well – an AVRL restructuring check-in, an overview of our new Respectful Workplace Policy, and we’ll be taking a journey through current AVRL programming and reviewing the associated materials, kits and props which can make all that happen. While you won’t be able to visit one of our libraries on June 6th, please understand that we’ll be working, and learning, to serve you better!